Boo started school this year, and it's been a big adjustment. We really cut down our after-work hikes with her, because she was so tired and cranky. But on Labor Day, even though she was still out of sorts, we dragged her to the trail. And we woke her up gently (she hasn't fallen asleep in the car for ages!) After we poked some food into her, she perked back up. We took a hilly, 2.5 mile hike. And it really perked her up. She was the happiest she's been since school started. Well, lesson learned right there. Back to the woods even if she doesn't want to and would rather play with her friends. When she wasn't running, she was making "secret trail markings". She wouldn't tell us what they were. Of note in the pic: whistle on a break-away cord, camera, temporary tattoo, and a stick. Then her sandals gave her blisters, she she spent the second half of the hike running barefoot up hills. 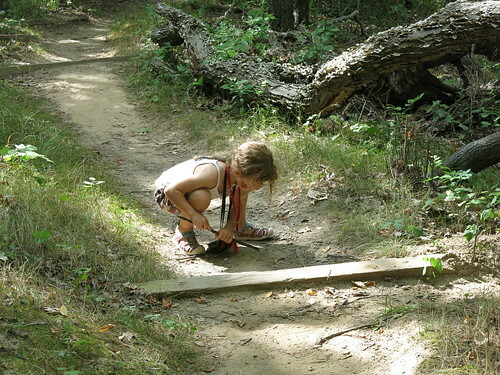 Do you kids do better for being outside, even when it seems counter-intuitive?